PULLMAN, Wash. – Viruses are about the simplest and tiniest creatures on Earth. They also can cause an amazing amount of chaos and destruction. 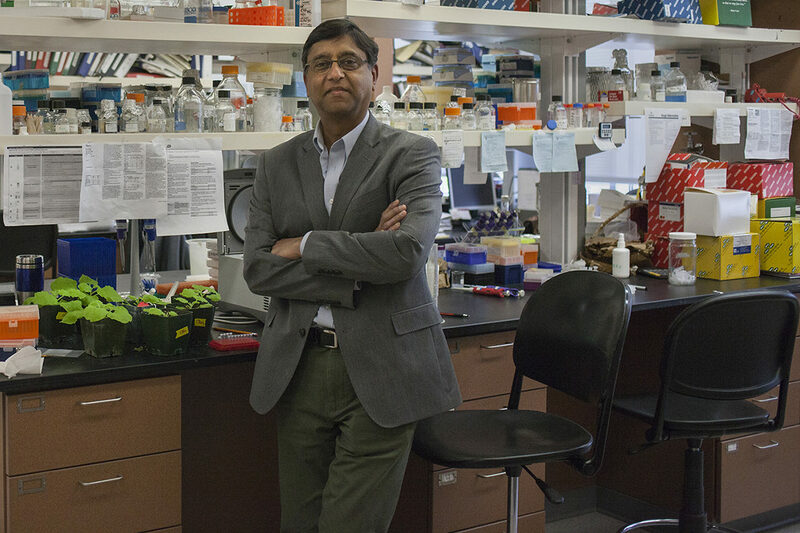 Washington State University virologist Hanu Pappu, like many in his field, has dedicated his life to helping lessen the negative impacts of viruses. The significant contributions he has made in the field of plant pathology over 30 years recently resulted in the reception of a prestigious Humboldt Research Award. Pappu’s research often explores viruses that threaten the profitability and sustainability of potato and onion crops, and floriculture industry. Humboldt Awards recognize a researcher’s entire achievements to date, including fundamental discoveries, new theories or insights have had a significant impact on their own discipline. In addition, that researcher is expected to continue producing cutting-edge achievements in the future. The awards are granted in a wide variety of disciplines, including social sciences, engineering, literature and more. Pappu’s award is for the field of phytomedicine, known as plant pathology in the United States. The award is based in Germany, and winners must be nominated by German colleagues. Pappu will receive his award next spring at a ceremony in Germany that is attended by the German chancellor and president. “I got a voice mail notifying me about the award, and I didn’t believe it,” said Pappu. Pappu is the President Samuel H. Smith Distinguished Professor, the Carl F. and James J. Chuey Endowed Chair in the WSU Department of Plant Pathology, and a member of the WSU’s Interdisciplinary Ph.D. Program in Molecular Plant Sciences. The award isn’t just a fantastic achievement and a fancy medal, it also provides for additional collaborative research opportunities with his German colleagues. The Humboldt Award allows for Pappu to spend up to a year working in Germany with his colleagues, which he plans to use working on learning more about how a virus interacts with a host plant and the plant’s defense response. “Understanding the steps in between how a virus enters a plant, and how it brings about disease in that plant, can give us clues as to where we can intervene and interfere to stop the virus infection and reduce the damage,” Pappu said. Viruses can cause up to 25 percent of a crop to be destroyed, a major impact for both farmers and the food supply they provide, he said. Many viruses, including tospoviruses, potyviruses and geminiviruses that he works on, are transmitted by insects, who serve as vectors moving the virus from plant to plant and field to field. “Viruses have this direct impact in causing crop damage,” Pappu said. “But they have an indirect impact on the environment as well because of the attempts to control the insects that spread them. Managing viruses thus can not only ensure food safety and security but contribute to environmental stewardship as well.” This award is a recognition and reflection of contributions by more than 30 graduate students, post-docs, and visiting scientists, and numerous collaborators to my research program” Pappu concluded.